Last week we talked about some revelations about my family history of infertility. One thing I learned was that my aunt, the child who came after 6 years of my grandparents’ secondary infertilty, carries a name that is a reminder of the family-building struggles. It seems that after many years of trying for #2, including going to doctors who told my grandmother that all it took to make a baby was a man and a woman in the same house, they decided to pursue adoption. In the middle of the adoption process, they finally got pregnant again (proving that untrue old wives’ tale). The name they chose for the baby was the name of their adoption caseworker! They picked the name because they liked it, but I wonder how often the name itself reminded them of how hard they had to try to have that second baby. In my own life, even if I wanted to forget my infertility — which I wouldn’t — I have a constant reminder: twins. I suppose that if I had one baby I might be able to go a day here or there without thinking about IF, but because I have twins, I think about how they were created every single day… and a stranger asks me about their origins almost as often. My other constant reminder: the huge hole in our bank account. 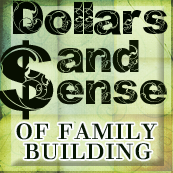 Do you have any ever-present reminders of your family-building struggles? I just had a chance to spend a few days with my grandmother. These few days were the most time I ever spent alone with her. I grew up halfway across the country from her, so I only saw her every couple of years. As an adult I’ve seen her even less often. I had a great time hanging out with her and the twins, and we did a lot of talking. In one of the first ever Thoughtful Thursdays, I looked for clues about infertility in the family tree. At first, she didn’t take the bait. And then she did. I learned more than I ever expected! Years of trying, ineffectual doctors, starting the adoption process… fascinating stuff. I am so glad that I asked (albeit without really asking). What question do you wish that you could ask a relative? If they are still around, why haven’t you asked? Sorry to be late posting Thoughtful Thursday this week. I spent Thursday on planes and in airports, then Friday I had limited computer access. I’ve never been this late posting Thoughtful Thursday before, but a couple of times I’ve posted on Friday instead of Thursday. Whenever that happens, I receive a handful of comments and emails asking if I’m okay. While I appreciate the concern, it also amuses me. Personally I’m not quick to worry when anyone is late, whether with a blog post or an in-person appearance. Plenty of people in my life are quick to worry, though — my mother, my mother-in-law, and my other mother-in-law are at the top of the list. I’m even less likely to worry when dealing with someone who has a tendency toward tardiness. One of my husband’s friends is so perpetually late that we’ve established a rule: take the time the guy says he will show up and add 90 minutes. It’s like he lives in his own time zone. We call it Edgar Time. Though he’s no Edgar, my husband is not great at estimating time. If he says he’ll be there in 20 minutes, it will probably be 45. I don’t start to worry unless he’s more than an hour and a half late. His mother, though, is quick to worry and slow to figure out lateness patterns. If we’re 10 minutes late she starts to freak out and calls all of our numbers. We usually arrive before she starts calling the hospitals and morgues. DH finally set her straight by having a talk with her about the odds. What are the odds that he’s lying in a ditch by the side of the road? Very small. What are the odds that he’s going to be late? Almost 100%. If a very punctual person is late there might be cause to worry, but with some people, worry would be better replaced with exasperation. How quick are you to assume the worst when someone is late? Welcome to May’s Intelligentsia, the people who commented on every Thoughtful Thursday post for the month of April. #16: Wiseguy from Woman Anyone? #6: A from Are You Kidding Me? #5: Stacie from Heeeeere Storkey, Storkey! A few days ago I spent time with a handful of people at the home of a new baby and her parents. At one point, the husband chastised his wife for having left the baby in the bathtub earlier in the week. She defended herself that it was only for a minute to run upstairs and get an article of clothing. Before we could say anything, someone else in the group chastised her. “You really shouldn’t do that. You can’t leave her alone in the bath for even a second.” When she tried to explain herself, he reiterated, “You cannot ever leave a baby alone in the bathtub.” I think she got the message. I hope she got the message. If that fellow hadn’t spoken up, I’m not sure what I would have done. People ask me for advice often, but unless I’m asked, I don’t like to give unsolicited advice. There was a clear safety issue in this case, but even so, I’m not in the habit of walking into someone’s house and telling them that they have done something horrible. The fact that the husband was calling her out in front of other people indicated that he knew she was wrong, and perhaps he was trying to garner support in an effort to convince her. In a way, he was soliciting advice on her behalf. Part of the reason I don’t care for unsolicited advice is that it tends not to go over well. People are rarely receptive. It also creates a dynamic where the advice-giver seems to be acting superior, which is no fun for anyone. Furthermore, in many cases unsolicited advice isn’t even correct or helpful. The people who give the most advice seem to be the ones least qualified to do so. With DH, I have gotten less and less bossy over time. Sometimes I ask him to do something or I give him tips for optimizing efficiency or improving technique — how to put on a diaper to prevent leaks, or how to cut the core out of an apple without throwing away too much edible fruit. Recently he thanked me for the way that I gently offer constructive suggestions. It’s only taken me a decade and a half to perfect. What is your stance on giving unsolicited advice? In what situations do you give advice that people haven’t asked for, and when do you keep your opinions to yourself?